Amy “Pat” Walker, one of the state’s most generous philanthropists, died Sept. 2 at her Springdale home surrounded by her family. She was 97. Walker and her late husband, Willard Walker, were the co-founders of the nonprofit Willard & Pat Walker Charitable Foundation, which contributed generously to medical centers, colleges and universities, public schools, libraries, park and recreation facilities, performing arts centers and museums, churches and religious institutions and social service organizations. Willard was the first manager of Sam Walton’s five-and-dime store in Fayetteville, and the couple’s early investments in Wal-Mart Stores Inc. resulted in an extraordinary amount of wealth. 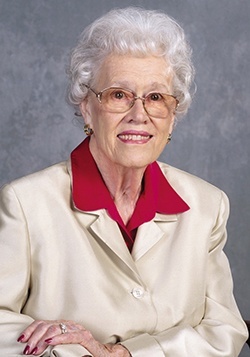 Walker’s philanthropic efforts throughout the state were recognized several times over, according to her obituary, including most recently being inducted into the 2016 Arkansas Women’s Hall of Fame. She was also recognized with distinguished service awards from the Walton Arts Center, Razorback Foundation and University of Arkansas for Medical Sciences. A memorial service was held Sept. 8 at the Springdale High School Performing Arts Center, and a funeral service through Sisco Funeral Chapel of Springdale was held Sept. 9 at Spring Creek Fellowship in Springdale.